The mic input control is also a pull switch for bright. One of the Studio series, model unknown. Its very rare, I believe, as the only info I have ever found relating to it is some photos on your site. I bought it as a 1963 model apparently, back in the late 80s. 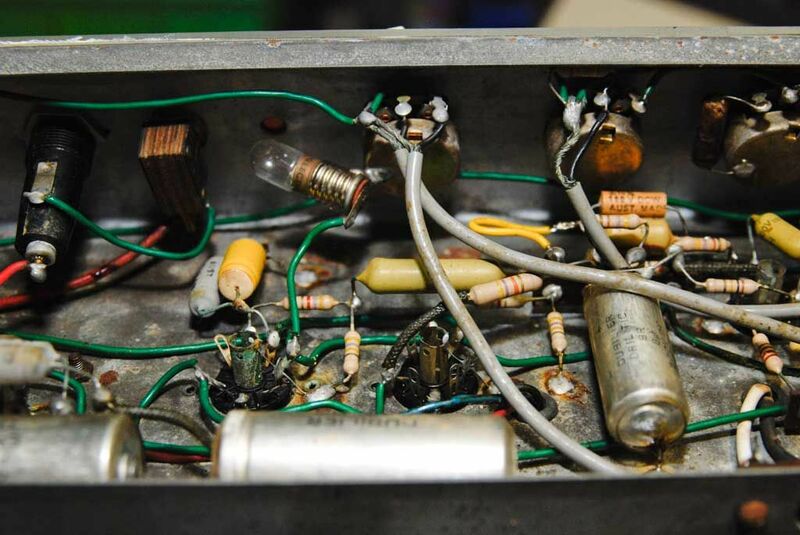 It has 2 EL84 power valves, 3 12AX7 preamp valves, a larger valve for reverb I think, and a small valve recto. The valve line up may well have been quite different originally. Made early 60's I believe. 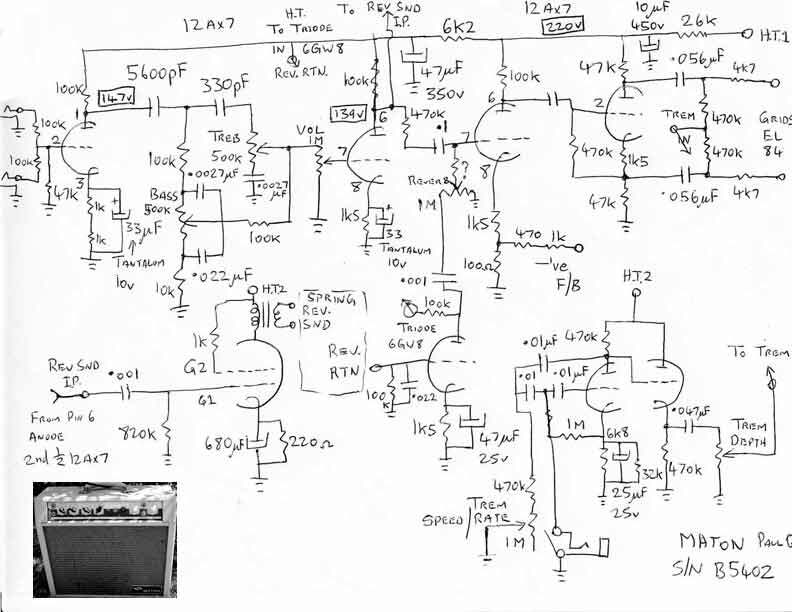 Probably up to 15W output (around 12 I would guess), has 2 X EL84, 3 X 12AX7, another (bigger)9 pin valve (for reverb i think) and a tube recto. 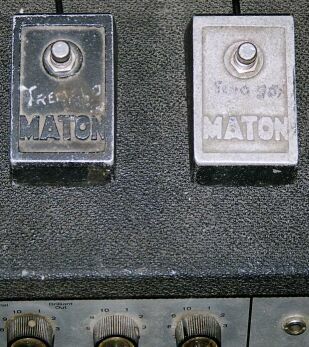 2 inputs, single channel, with (originally) footswitchable echo - now that socket is used for the trem. 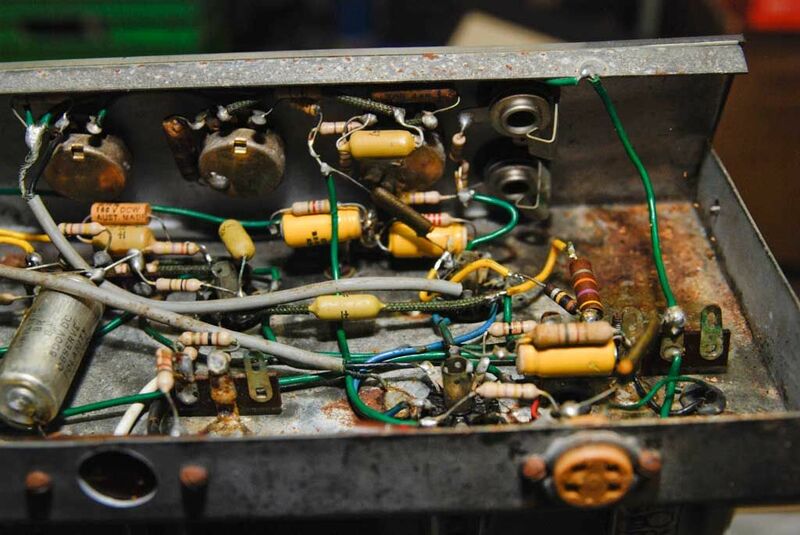 I play blues, some jazz feel stuff, some funk, used this amp as a portable rig for jam sessions, I used to play mainly rhythm and for that it lacked bottom end - it broke up early, and sounded like a little Marshall! The 12 inch speaker fixed that, and playing through a blue tube pedal for a bit more bottom. Very nice now. One thing is that, even with such an efficient speaker, it's not really loud - which is usually a good thing - but when playing with a drummer or another guitarist with a big amp it can sometimes get a little drowned out -especially if I am trying to keep the bottom end happening. But that doesnt happen to me much, and its really the amp's only shortcoming. This amp is very compact, light (even with the Celstion's 50 oz magnet) and better featured than most small/ practice amps. S'pose I should rate it highly here, as its got trem AND reverb! Ah, the 60's eh? Drive it a bit, with or without a pedal, and it rocks! Chicago blues overdrive, add some trem for that swampy feel, or play cleaner for jazz. Very nice. Clean distorts after about 6 or 7, but its sounding pretty good by then. Play a profile MIJ strat with GFS vintage pups, or a samick 335 with gfs 59ers, or a godin solidac with duncan jazz pup, via a constantly changing pedalboard, usually with Goudie FX comp + o/d (lovely pedals) arion sch - 1 for vib, maybe an EQ, and analogue delay, run in stereo at home, with either a WEM clubman mk viii, or guyatone 640 as the other channel. Suits my style well. 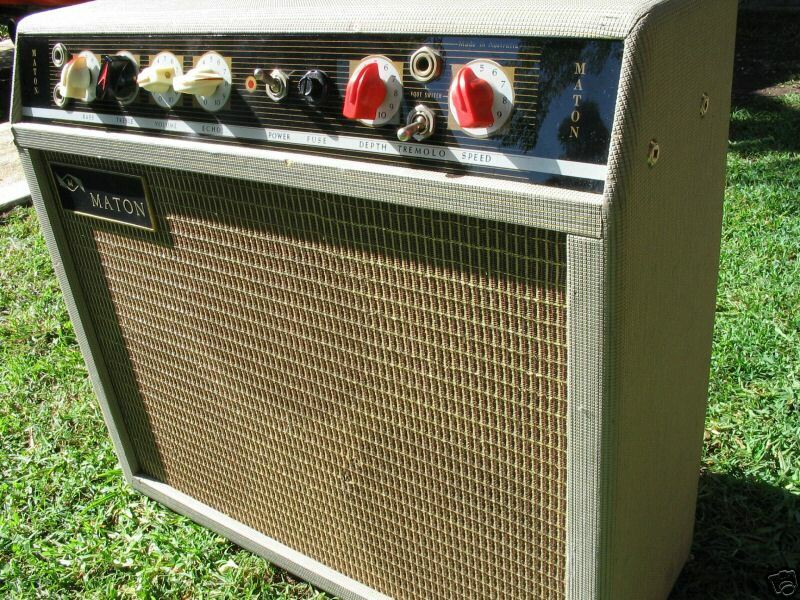 I sometimes do a bit of country, probably this amp is not so good for that, but for everything else i play, its great. Its reliable now, but it took a bit to get to that state. 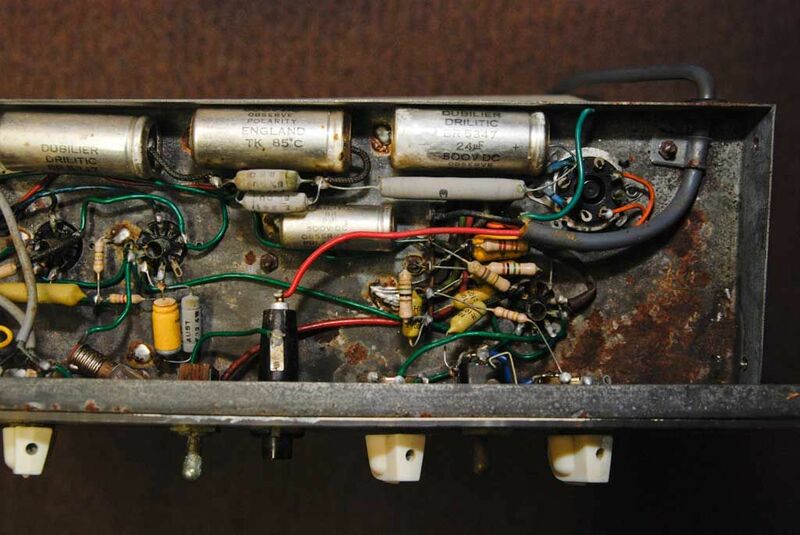 I bought this amp many years ago, in a clean, well presented but inoperative state. Cant remember how much I paid, but I think it was 50 bucks or so. It looks gorgeous, and I was happy to buy it just to put on my mantlepiece (I didnt actully have a mantlepiece then, but I'm sure you get the idea). rebuild 3. Driving this thing hard is fun, no doubt a great way to let off steam, until one day, the amp let off some steam itself - or smoke anyway. Strange sensation, one second the windows are rattling, the next all i can hear is my pick on the strings, and theres this little wisp of smoke coming up from the treble pot. This time i went to a hi fi guy, who did a major overhaul - and I went back to valve recto while i was at it. i came away with a big pack of lots of doodads he'd replaced. 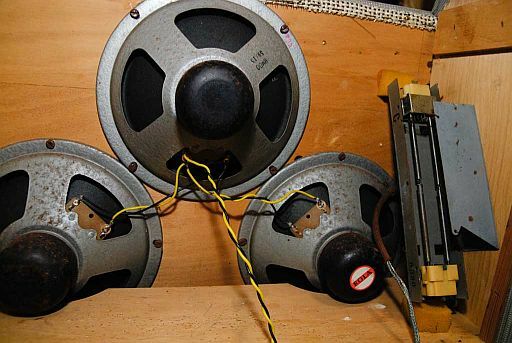 Sounded good for years after that, a bit less volume but lovely tone - until it started getting a sudden and complete loss of volume, every time it was asked to work a bit. 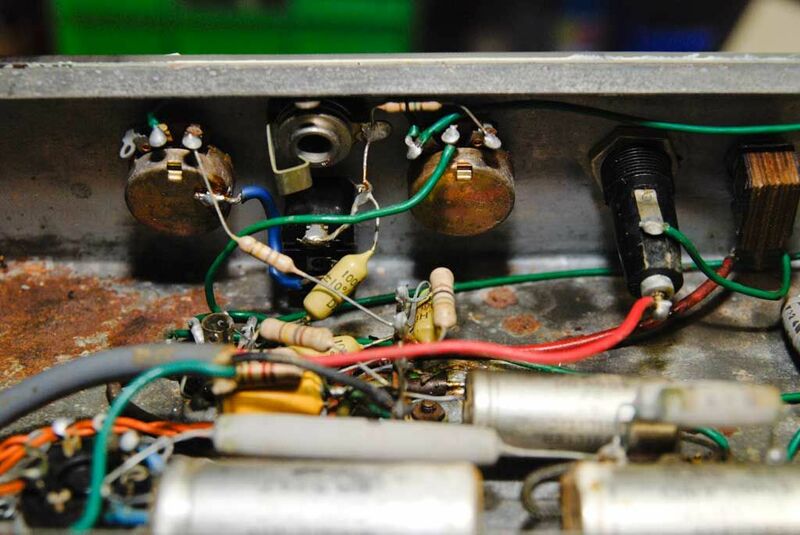 This last one was tricky, but my new amp tech found the problem - a dry solder joint, which only lost its integrity when it got hot. Now this amp runs sweet, I can push it hard when I want, or use it as one half of the stereo jazz lounge rig, either way its fine. 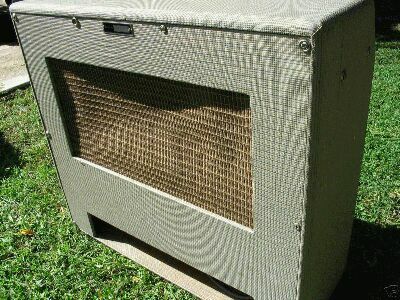 I wouldnt want to gig with it now, more to protect its rare tolex than any other reason, but if i did?.....i think I'd take a back up! Maton have a good archive listing on their website. Unfortunately, this model is so rare its not even listed there. 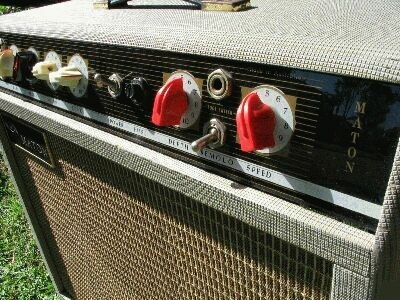 If it was stolen I'd probably never find another one, but I'd probably just look for an old fender.....theres a reason why everyone says their clean tone is “just LIKE a fender”, yes??? The saga described above has not been as bad as it sounds, and it took place over many years. This was my only amp for a long time, and I'm glad I still have it. 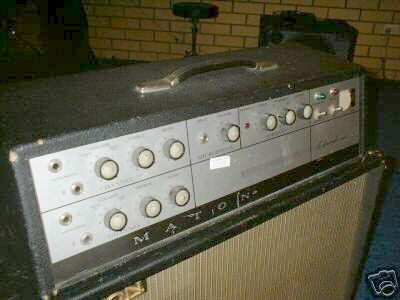 Its portable, toneful, looks great in the loungeroom, and rocks on when i want it to. Cant wait to hear it with the greenback. 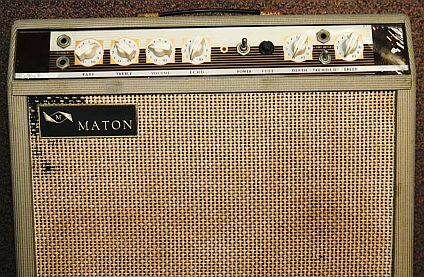 I own a vintage Maton valve guitar amp, I was seeking knowledge and found your great site - so much information. 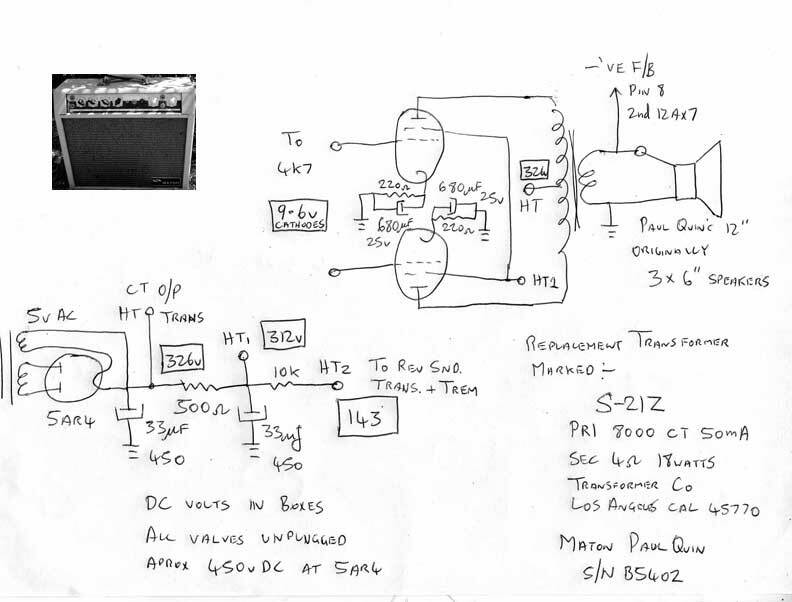 I can only find one reference to my amp on your site- listed as “Masthead Mystery” with an article by Paul Quinn (quote “very rare”) submitted 5th March 2007. I have not found any references anywhere else. 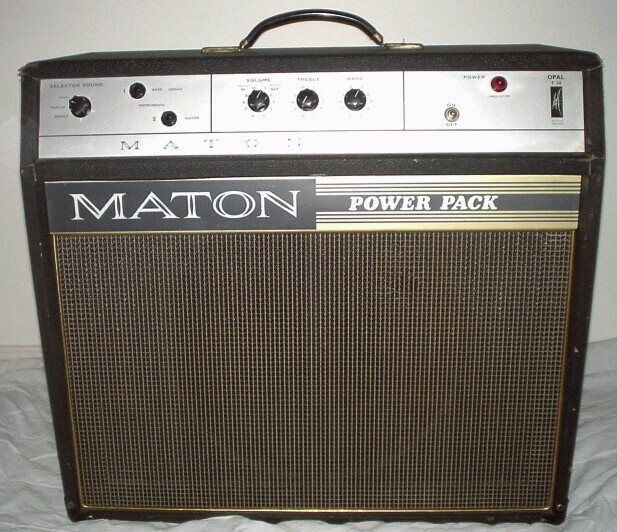 Even my correspondence with an ex-Maton employee that collects amps, has been fruitless. Serial number: and date 3/20 5571-hand scribed on small silver S/N plate 1960?? Transformer numbers: 3 of ?? Rated output power: 15 watts ?? 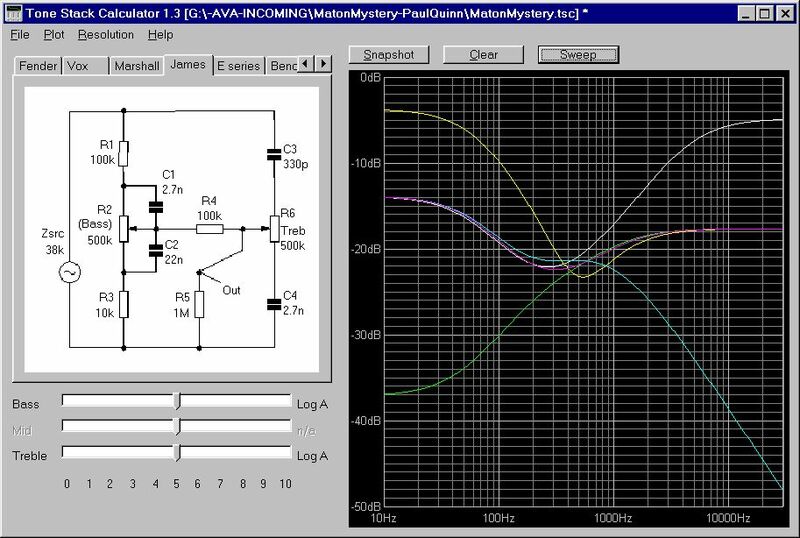 Schematic Circuit Diagram: none - would appreciate very much as am trying to maintain all systems go! 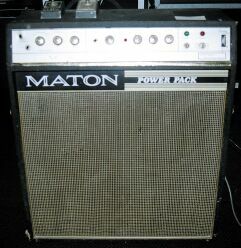 Condition: Amp is working well with my Maton Acoustic/electric (after replacing 2 resistors and 2 capacitors) . 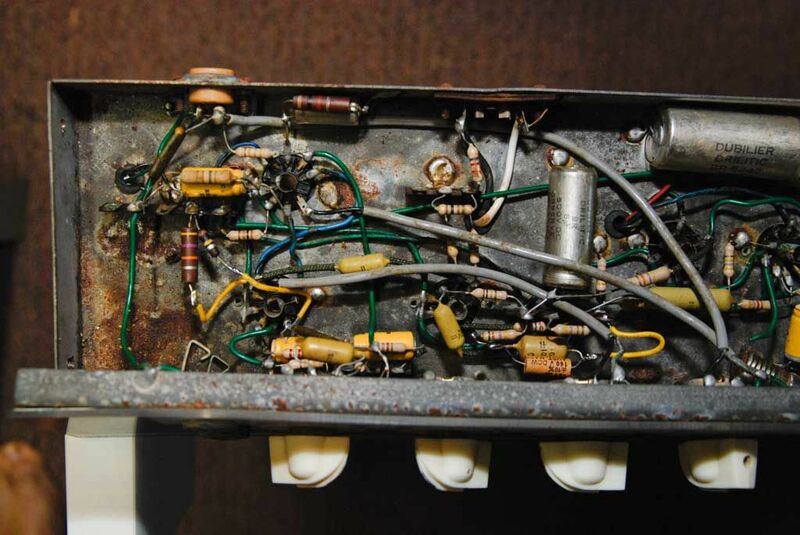 Tremolo not working. All knobs, badges, covering, cabinet, as original. Panel rear A, Panel rear B, Panel rear C.